2014 Summer / Fall Tournament Season! Level Up’s tournament series continues with Seasons 3 and 4 at the New Super Arcade in Walnut, California! In celebration of Super Arcade’s grand re-opening, we’re bringing new attractions to our flagship weekly events! Note: This is a Bring Your Own Controller Event! Special thanks to all our sponsors for supporting our scene! Congrats to Team Weds Night Fights! Team Weds Night Fights delivered the beat down at EVO2014 by defeating team Next Level Battle Circuit in a brutal 5v5 exhibition. 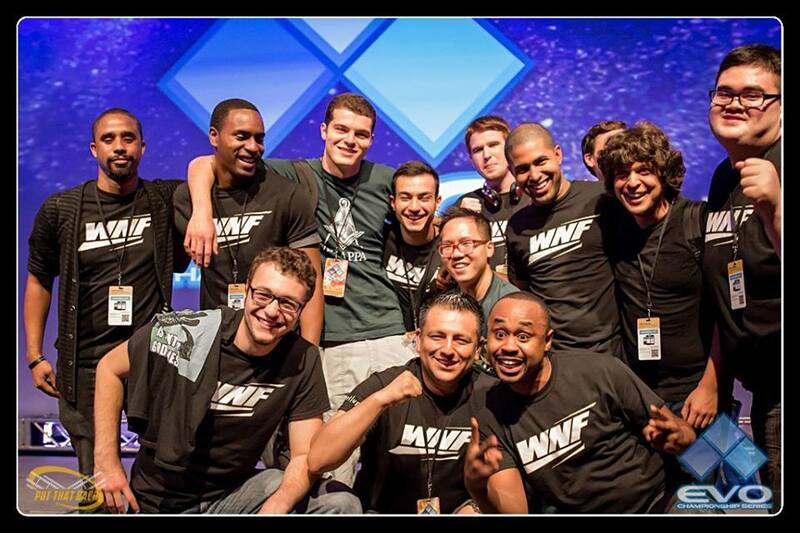 As a reward for their hard work and dedication to WNF and Super Arcade, the team won $1,000 for their victory. But that’s not all, we’re also adding $500 pot bonuses to the overall finalists of Seasons 3 and 4 to continue their training and prepare for the next major event! Congrats to NGL Marq Teddy, Veloc1raptor, Snake Eyez, FRQ Filipinoman, and Keno for their amazing performance! Ultra Street Fighter IV is the headliner title at Weds Night Fights and the retail version is finally upon us. We have a tradition of bringing the most competitive platform to use for our events by introducing the Xbox360 as our flagship console for the Street Fighter IV series, up until now. This August 20, we’re featuring Ultra Street Fighter IV on PC for Seasons 3 and 4 powered by Alienware! We feel the fighting game scene has an opportunity to grow by competing on a platform that’s accessible and predominately used in championship gaming events world wide. Street Fighter is the most popular fighting game in the world and we’re looking to bring in the same action competitively every Weds night! Catch Weds Night Fights every Wednesday at 9:30PM PST only on http://twitch.tv/leveluplive . We’re proud to announce Weds Night Fights is a Capcom Pro Tour ranking event! Top 16 Ultra Street Fighter IV finalists will win points for their overall performance in Season 3! Good luck to all competitors! For more information about Capcom Pro Tour, visit their site http://capcomprotour.com/ . We’re also proud to announce Weds Night Fights is a qualifier for the Master Series! 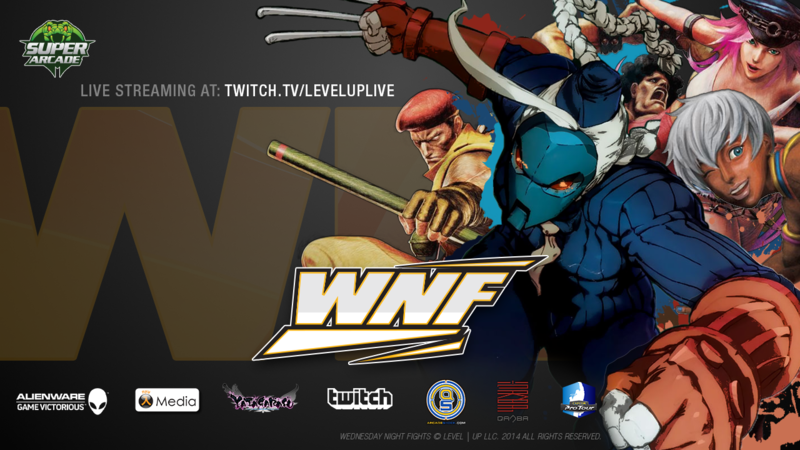 WNF Season 3 Overall Grand Champion will win flight and lodging accommodations to the Master Series presented by Canada Cup. $20,000 in cash and prizes up for grabs vs international competition awaits! For more information about The Masters Series, visit their site http://canada-cup.ca/canada-cup-gaming-presents-the-masters-series/ . The Runback returns with some action packed fighters for Season 3 and 4! 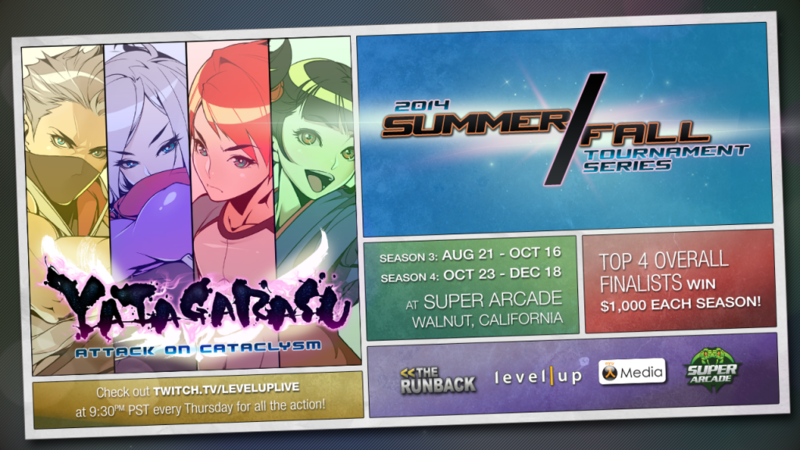 Ultimate Marvel vs Capcom 3, Killer Instinct, and introducing Yatagarasu: Attack on Cataclysm will rock our game lineup! We’re keeping the roster open in preparation for games released in the Fall so stay tuned for details! 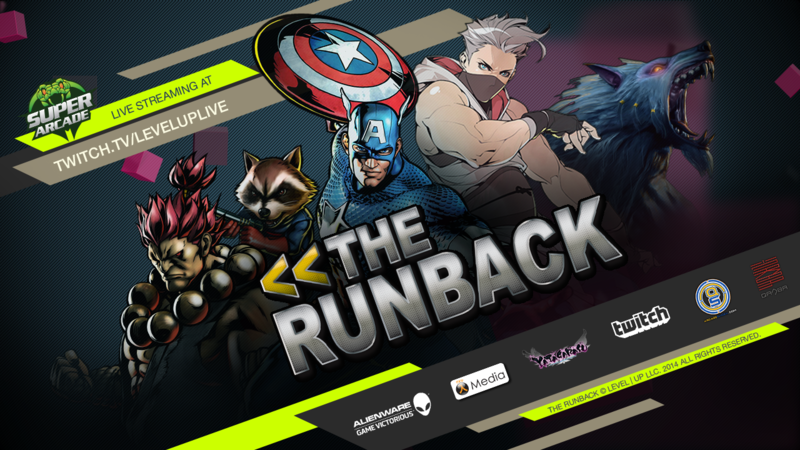 Catch The Runback every Thurs at 9:30PM PST only on http://twitch.tv/leveluplive . Congrats to our UMVC3 Overall Season 3 Finalists! Yatagarasu Season 3-4 Tournament Series! Nyu Media and Level Up are teaming up to bring 2 full seasons of new fighting game madness at Super Arcade! Introducing Yatagarasu: Attack on Cataclysm, our first PC title for The Runback! Season 3 and 4 overall finalists will win $1,000 in cash for their skill and dedication to this awesome title! Want to try out Yatagarasu? We’re hooking up some of our awesome Twitch subscribers with a copy of the title! Not a Level Up subscriber? Subscribe here and join our awesome fans with fun emotes, channel badge, and contests just like these! Congrats to our Season 3 Overall finalists! Steam Greenlight: Yatagarasu is officially greenlit by the community! More details can be found here .